I hate to say it, but I’ve grown a little tired of quinoa lately. While it will always be one of my favorite grains/seeds (it has that split personality thing going on), lately I’ve been craving something more sturdy and robust, a grain that can stand up next to all the flavorful summer produce and say “Bite me! Chew me! I’m not just hiding in the background to soak up all the salad dressing!” This week, at least, my heart belongs to an assertive little grain called farro. Farro is a grain made from an ancient variety of wheat called emmer, and you can buy it either pearled (perlato) or whole. Pearled farro, which is what I used in this recipe, has had some of its outer hull stripped off, making it cook much more quickly. If you can’t find farro on your supermarket or health food store shelves and don’t want to order it online, you can use one of its cousins, spelt or wheatberries, but both will take longer to cook than pearled farro. If you’re gluten-free, please stay away from farro because it is wheat; I recommend substituting buckwheat or brown rice instead. Though farro is assertive, it is not a bully. Its flavor isn’t as earthy or intense as buckwheat groats and won’t overpower other ingredients, so you could say it plays well with others. 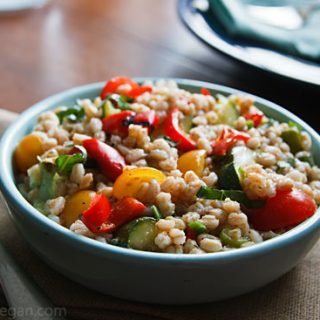 But farro is much chewier than rice, quinoa, or even barley, adding an interesting texture to a grain salad like this one, which uses those ever-abundant vegetables of summer, tomatoes and zucchini. Zucchini doesn’t have a lot of flavor of its own, but grilling gives it a smoky edge, and I’ve included grilled pepper to add a little zing. The lemony dressing is based on this one from Martha Rose Shulman, though I’ve replaced the olive oil with a slurry of chia seeds. I hope you find the results as addictive as I do. 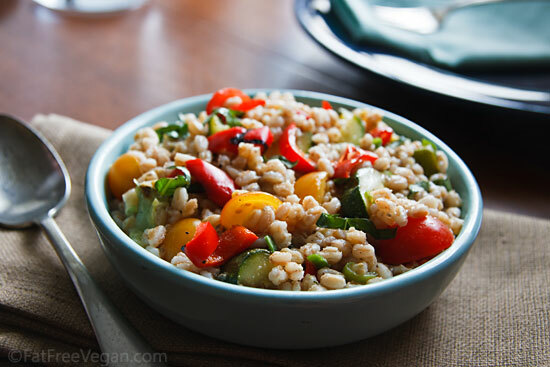 The chewiness of farro adds an interesting texture to this vegan grain salad, which features fresh tomatoes and that abundant vegetable of summer, zucchini. Rinse the semi-pearled farro and place it in a medium pot. Add enough water to cover it by at least an inch and a half, bring to a boil, and cook until it’s tender but still firm, about 20 minutes. Before draining it, remove 1/4 cup of the cooking water and mix it with the chia seed in a small bowl. Drain the farro, rinse it with cold water, and place it in a large serving bowl. While the farro is cooking, heat a grill or grill pan (I used my Foreman grill). Grill the zucchini until they are golden brown on the cut side and beginning to soften. Remove them from the grill to a cutting board and cut into 1/2-inch slices; add them to the farro. Grill the pepper just until grill marks appear. Remove it to the cutting board, chop it, and add it to the farro, along with the tomatoes and green onions. To the chia seed mixture, add the vinegar, lemon juice, mustard, garlic, salt, and pepper. Whisk together well and add to the farro mixture, stirring to make sure it’s well-distributed. Cover the salad and refrigerate until chilled. Just before serving, add the basil and check the seasonings. Add more salt, pepper, and lemon juice if necessary. 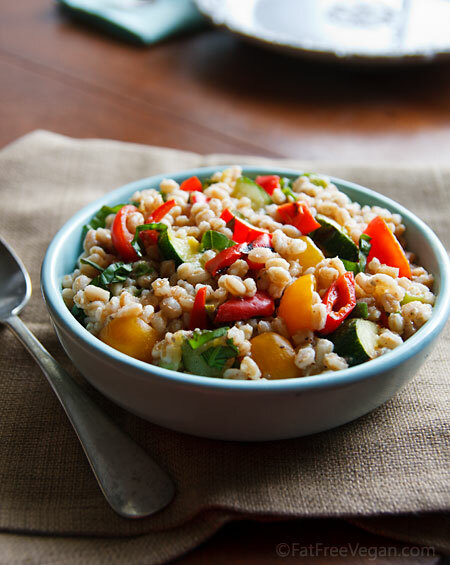 Instead of pearled farro, you may use regular farro, spelt, wheatberries, or any other large grain. For a gluten-free version, try brown rice or buckwheat groats. Cook according to package directions or check the internet for cooking times because pearled farro cooks much more quickly than most other large grains. If you’re using pre-cooked grain, use 4 cups. This post contains Amazon affiliate links to the products I actually use. When you buy something through them, I receive a commission that helps support this site. Thanks for your purchase! Wow, at first I thought “farro? I’ve never tried that before!” But then I read on to learn where it comes from and realized I have tried it! I grew some emmer wheat last summer! What a coincidence lol! It was a pain to harvest, especially separating the hulls from the seeds. I never knew that was called farro. I wonder if I even can find that in my local grocery store. Thank you for the recipe! I shall try, I might have to use quinoa instead. Not sick of it yet! I have never, ever heard of farro. And I thought I knew every grain out there! Thanks for including gf options. My daughter & I are gf, the rest of our family is not. This looks really good. I have some kamut which I have not used yet-I think I will use that. I’ll get the farro next time I shop. Farro is very popular in Italy where we mainly add it in soups and minestrone. Cool recipe! Never heard of it before. Thanks for introducing it! It sounds like the perfect texture for soups and stews. Your dish looks beautiful with all of its colours! Thanks for this – I can’t wait to try it! I had farro in a dish at a local dinner club a few months ago and loved it. I haven’t seen it anywhere since then. Thanks for sharing the amazon.com link – our local store doesn’t have farro but I’ll get it here for sure! Yum! Like most other people here I have never heard of Farro before. After reading that it is not gluten-free I also read that it has a lesser amount of gluten the wheat has, it is more easily digestible by the human body than most other forms of wheat, so if you just have a mild gluten sensitivity Farro may work for some but not for all. Hopefully this helped those who was unsure whether it was gluten-free or not, and the recipe looks as delicious as always, Susan! Love grain salads. Yours looks great with simple and fresh ingredients. oh wow that looks so wonderful! i love the colors! This dish is absolutely delicious, I especially loved the dressing! I went with the flaxseed version and replaced the mustard with 1/2 tsp mustard powder for a milder flavour (can’t handle super-spiciness I’m afraid). Farro’s proving difficult to find here, so I ended up with spelt instead, but one of these days I’ll find it and give it a try, love experimenting with new grains. 😀 Thank you for the recipe, it really worked out great! The salad looks so healthy and sumptuous. Is adding grated cheese on top of the salad a good idea? Sounds delicious. The grilled vegetables will give it a great flavor! I have a dumb question…is Farro also known as barley? It looks the same to me! No, it’s a kind of wheat. Barley is a different grain, a little smaller than farro. Another “husband approved” dish! Thanks! I made a doubled version of this with barley for this past 4th of July pot-luck party and it was a hit! I’ve been thinking about it so much that I just made another batch with wheat berries and roasted eggplant cubes to enjoy this week! I just love how the acidity of the vinegar and mustard pairs with the sweetness of the roasted veggies. I also used roasted sweet Walla Walla onions (they are localish and on-sale up here in Washington) in place of the green onions. Simply a wonderful salad! How does farro compare with job’s tear (Chinese barley)? They look similar, but not sure about texture. Job’s tear is also gluten-free, so maybe a good alternative if gluten is not on the menu? They’re similar and you’re right about Job’s tears being a good gluten-free alternative. I tend to like the flavor of farro better, but that’s a matter of individual taste.